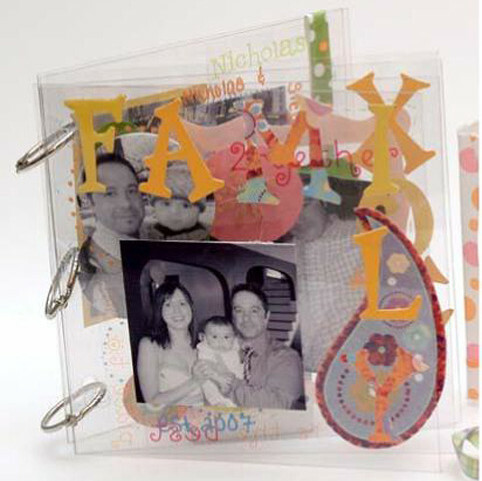 Project Description: Create your own custom photo book with Grafix Craft Plastic. Punch 3 holes on the outer edge of your sheets of plastic. Be sure that the holes are placed evenly on all sheets, you can use a template to ensure correct placement. Print your photos on to photo paper. We have chosen to pint the photos in black and white to make them stand out among the colorful papers. Use punches and decorative scissors to trim your photos. Back them with Double Tack. To decorate the pages we have cut out sections of patterned paper and applied them with Double Tack. Additional embellishment has been added with Permapaque Pens and Ribbon. For clear journaling we have printed on Computer Grafix Adhesive Backed sheets, cut out and applied the sentiments. Add your pictures to the layout. Secure the pages together using 3 binder rings purchased at an office supply store.